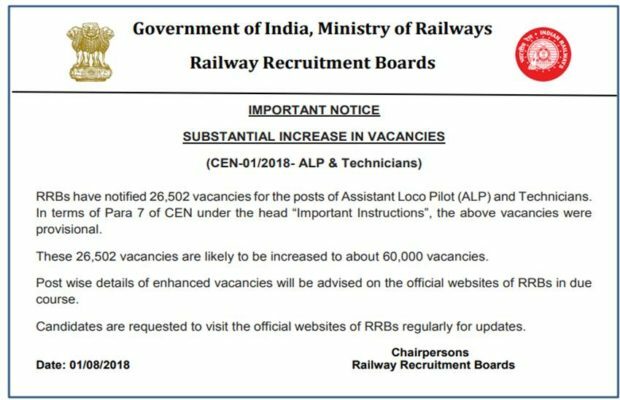 RRB ALP Result 2018 is expected to release soon by Railway Recruitment Board. The result is likely to be out on 01 October 2018. All those candidates who had appeared in the RRB ALP would be able to check their result on the official websites of the respective RRBs zones, once the result will be declared. RRB ALP 2018 was conducted from August 9 to September 4 in multiple sessions. As per official data, more than 47 lakh candidates have applied for RRB ALP exam. Earlier, the board had released the answer key for RRB ALP CBT exam on 13 September 2018. The merit list of the selected candidates will be made after analyzing all the objections against answer key, submitted by the candidates. The time period of 4 days had been allotted to candidates for submitting their objections against the answer key if any. The last date for submitting the objections in answer key was 25 September 2018. This is after four years that RRBs are conducting the recruitment of Assistant Loco Pilot and Technician. Last the recruitment was conducted in 2014. This year RRB had invited 26,502 vacancies for the recruitment of Assistant Loco Pilot/Technicians posts. Around, 47.56 lakh, candidates have applied for the exam. Recently, the board has revised the number of vacancies, due to which the total number of posts have gone up to 64,371. Candidates who will clear the first stage examination for Group C- ALP and Technician posts would be called for the next stage of the selection process. On the basis of RRB ALP 2018 result, over 9 lakh candidates will be shortlisted for the second stage. The result will display the qualifying status of candidates for the next round of selection process.